At 15 he was shot by horse thieves, and his mother tutored him in the faith during the difficult recovery. After completing Southern Baptist Theological Seminary training in two years, he pastored a church of 13 members, which grew to 1,000 in three years. In 1909 he moved to the First Baptist Church of Fort Worth. There he founded his own newspaper and pioneered radio preaching. Membership increased tenfold. When Norris preached, he roamed the platform shouting and weeping, with a Bible in one hand and a newspaper the other. He brought monkeys into the pulpit to mock Darwinism, and he held a public funeral for “John Barleycorn” when Prohibition passed. In a sermon series against municipal corruption, he preached on “The Ten Biggest Devils in Fort Worth—Names Given.” Enraged community leaders tried to run him out of town and his life was threatened. When his church was destroyed by a fire of undetermined origin, Norris was indicted for arson but eventually acquitted. In his 1926 sermon series “Rum and Romanism,” he attacked the Catholic mayor of Fort Worth, accusing him of misappropriating funds to Catholic causes. Norris received a threatening phone call from a friend of the mayor, who later showed up in his church office. Heated words were exchanged, Norris pulled out a pistol and shot the man four times, killing him. He was tried but found innocent on the grounds of self-defense. Norris called himself “the Texas Cyclone” and was a whirlwind of activity. In 1935 he added the Temple Baptist Church of Detroit to his pastoral duties, and he commuted between his Texas and Michigan congregations for 16 years. He held revivals in 46 states. He was a founding member of the World Christian Fundamentals Association and a charter member of the Baptist Bible Union. He founded his own loose association of churches named the Premillennial, Fundamental, Missionary Fellowship, but the group fractured in schisms and discord. Deserted by most of his friends, he died of a heart attack while attending a youth rally in Florida. Curtis Lee Laws coined the term “fundamentalist” and made it part of the American lexicon. Laws established himself as a strong leader of the denominational conservatives during 20 years of successful pastorate. In 1913 he left the pulpit to become editor of an independent and influential Baptist publication, the Watchman-Examiner. Laws declared from the beginning an editorial partisanship in favor of the conservatives and against the modernist camp. Laws felt his greatest achievement at the 1920 conference was the agreement that fundamentalists would work within the Northern Baptist Convention and cease boycotting general meetings. He was a voice for moderation within the fundamentalist camp, and wanted to work to reform the Convention from within, believing that conservative thought still predominated. His more moderate position eventually split Laws from Riley and the militants in the Baptist Bible Union. He supported the formation of Eastern Baptist Theological Seminary and the Association of Baptists for World Evangelism as conservative organizations training ministers and missionaries loyal to the Northern Baptist Convention. Laws retained his position as a conservative leader within the Northern Baptist Convention until his retirement in 1938. When A. J. Gordon arrived at Clarendon Street Baptist Church in 1870, he set to reform the empty ritualism of a near dead church not with “innovations” but “renovations.” His “renovations” also left a mark on later fundamentalism. He preached scriptural inerrancy, the virgin birth, substitutionary atonement, and the continual reality of miracles. A close associate of D. L. Moody all his life, Gordon helped lead his Niagara and Northfield prophecy conferences. He taught in Moody’s interdenominational Northfield school. In 1877 Gordon founded the Industrial Temporary Home. It provided food and lodging for the needy on the grounds that it was futile to preach to those who had empty stomachs. Gordon also instituted the use of grape juice for Communion so as not to seat “that right-hand minister of the evil one” next to those just released from his service. Gordon was also active in a number of social causes. He was arrested for speaking at an outdoor meeting to protest the suppression of street preachers. He actively supported Prohibition. He upheld women’s right to preach and teach men in the church and their right to vote in civil elections. Almost single-handedly, Gordon raised the money for the American Baptists to adopt the Livingstone Congo Mission, and he supported local missions to the Jews and to Chinese immigrants in Boston. He also founded Boston Missionary Training School to train men and women for the mission field. After he died, just after celebrating his twenty-fifth anniversary as Clarendon’s pastor, his friends named his missionary school for him—today’s Gordon College. Born just before the Civil War, Riley earned his way to college raising tobacco. After seminary and a series of brief pastorates, he moved to the First Baptist Church in Minneapolis, where he ministered for 45 years. His concern turned almost immediately to the influence of rationalism, higher criticism, and evolution on the Northern Baptist Convention. His two books on the “menace of modernism” spread his fame as a champion of conservatism. His preaching style was very dignified; a reporter said Riley preached “like a prosperous banker.” But beneath the calm exterior was an inflexible opposition to modernist thought. He preached against drinking, gambling, prostitution, dancing, revealing dress, movies, and opulence. He also preached to convert listeners, and he designed a balcony aisle that lead straight to the altar so no potential convert could change his mind while wending down the back stairs. Riley held to “orthodoxy plus,” with the plus being aggressive, militant action. As early as 1908 he advocated division into two denominations with the liberals leaving, but by the 1930s, the fundamentalists were the departing group. In an attempt to unify the fundamentalists across denominations, Riley helped found the World Christian Fundamentals Association (1919). Membership was open to anyone willing to subscribe to a nine-point confession of faith. Riley led the organization to sponsor 20 bills in state legislatures against the teaching of Darwinism. Riley himself frequently debated pro-evolution speakers. Shortly after his move to Minneapolis, he founded Northwestern Bible and Missionary Training School (1902) to train pastoral leaders for small towns and rural congregations. In 1938 he founded Northwestern Theological Seminary to train urban pastors. In 1945 he founded Northwestern College, an undergraduate fundamentalist organization. On his death bed he put all three schools under the care of the young Billy Graham. Having laid the groundwork in his final years, Riley’s last organization—an independent Minnesota Baptist Convention—came about shortly after his death. "I never call myself a ‘fundamentalist’ “ Machen wrote to a friend in 1927. But he was indeed a fundamentalist, if an unusual one, and a key defender of historical doctrine. He was brought up in a genteel Presbyterian home. From his father, a prominent Baltimore lawyer, he acquired an interest in classical literature and rare books; his mother encouraged him to read English and French Victorian literature. On the other hand, he disliked the fundamentalist tendency to reduce the faith to a set number of essential doctrines. Nor did he think "that the prophecies of the Bible permit so definite a mapping out of future events.” He also refused to accept total abstinence from tobacco and alcohol. He sometimes even regretted not smoking: he once said he thought tobacco was “a wonderful aid . . . to friendship and Christian patience.” When a new president of Princeton Seminary declared his intention to broaden the school to include more liberal points of view, Machen led the resistance. After suffering defeat, he withdrew from his academic home of 23 years and founded Westminster Theological Seminary in Philadelphia (1929). He was also concerned that denominational missionaries had turned from the primary purpose of saving souls to medical and social work. So he formed the Independent Board of Presbyterian Foreign Missions in 1933. The General Assembly declared the action to be schismatic and ordered Machen to withdraw or stand trial. He stood fast and was suspended from the Presbyterian ministry in 1935. Now completely at odds with the leadership of his denomination, Machen founded the Presbyterian Church of America (later renamed the Orthodox Presbyterian Church) and was elected its first moderator. One year later, this independent “scholar of fundamentalism” died of pneumonia contracted on a winter trip to rally supporters for his vision of the one true church. The Stewart brothers grew up in a devout Presbyterian home in Titusville, Pennsylvania, where oil was first discovered. While both brothers took part in a number of oil—related enterprises, Lyman was more the risk—taking entrepreneur. After a couple of disastrous failures, in 1886 their “Adams Canyon #16” struck the first gusher ever in California. Their stock holdings mushroomed, and the brothers consolidated them into one corporation: the Union Oil Company of California. In 1909, he attended a service at Chicago’s Moody Church and was taken with pastor A. C. Dixon’s response “to something that one of those infidel professors in Chicago University had published.” The ordinarily shy businessman approached Dixon and revealed his idea to create a massive series of publications to discredit modernism. The tomes would be distributed to every pastor, missionary, professor, theology student, Sunday school superintendent, and religious editor in America and Britain. The bellicose Dixon, Lyman believed, would be the perfect editor. A few months later, the first of twelve volumes of The Fundamentals (right) was sent to 175,000 addresses. (From 1910 to 1915, the publishers printed about 250,000 copies, pressing 3 million altogether.) The books contained 90 articles that defended the authority of Scripture and other Christian doctrines. The volumes, however, were ignored by academic journals and denominational presses. 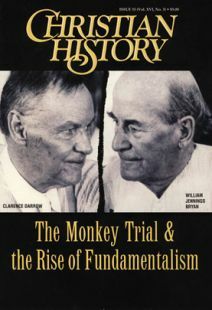 Historian Ernest Sandeen notes, “The Fundamentals plainly failed in its primary purpose—checking the spread of modernism.” Nonetheless, the Stewart brothers had published the earliest major text that educated fundamentalists in a broad range of subjects. Kelvin Crow is president of Education Support Services and contributor to the Historical Dictionary of the United States Army (Greenwood). The people, conferences, and organizations that made up the fundamentalist family. Modernism’s most popular preacher on the hopes of liberals. Fundamentalism’s most gifted theologian critiques liberalism. Women played a surprisingly prominent role in early fundamentalism.